Back with another old car to ID. This one is not nearly as obscure as the last one but, like the Velie from the other day, this one also has an aeronautical tie-in. I have obscured the hubcaps, because that would be just too easy. If you want a larger version of the photo, click to enlarge in Kinja, then open the photo in a new tab. 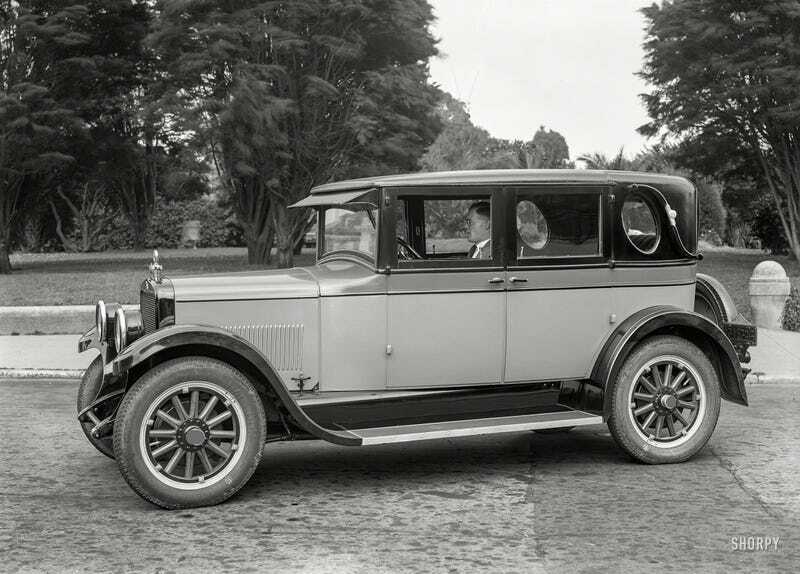 Answer: This is a Rickenbacker D-6 Coach-Brougham photographed in 1925. It was built by the Rickenbacker Motor Company, which was founded by WWI ace Eddie Rickenbacker, the most successful American pilot of the war. Rickenbacker Motors vehicles also featured the Hat-in-the-Ring logo that was the symbol of the 94th Fighter Squadron. The Rickenbacker Motor Company was only active from 1921-1927, but Eddie Rickenbacker enjoyed a career as a race car driver, military consultant, and served for many years as the president of Eastern Air Lines. He oversaw the expansion of Eastern into a major airline, had a hand in the development of new passenger aircraft, and worked to transform the airline industry into the modern era.